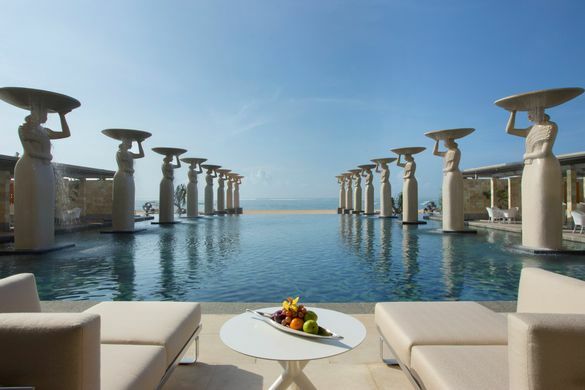 Award-winning luxurious beachfront resort, The Mulia, Mulia Resort & Villas – Nusa Dua, Bali, recently introduced a new interface on their online booking system that makes holiday planning one step easier for all holidaymakers. The new function has been added to ease the hassle of multiple booking platforms by providing the option of creating a one-stop service for all travelers from accommodation, culinary options, activities and a new option of booking flights in one go. With the new feature, guests can select various options of airlines and airfares to Denpasar, Bali from their country of origin to fit into their travel dates – thus enabling them to plan their trip effortlessly. In the meantime, guests staying at The Mulia, Mulia Resort & Villas, Nusa Dua – Bali, can also obtain rewards up to 25% of their transaction (in a single bill) when they dine at one of the signature restaurants or pamper themselves at Mulia Spa with the Mulia Dining and Spa Rewards program. The rewards can later be used on their next transaction or new stay or room bookings at Mulia Bali. Your luxurious getaway now made easy and rewarding, only at Mulia Bali. Find out more about this new feature and other special offers on www.themulia.com or call us at +62 361 301 7777. Mulia Villas – The exquisite 108 villa accommodations are the largest of their kind on the island. Ranging from one and two bedroom villas, all the way to the six bedroom Mulia Mansion.